Suits and blazers have always been a mana��s best friend when it comes to party or other ceremonies. Thanks to the film industry in our country we have opened up for experimenting with our looks. There is no doubt that Black and Grey are the perfect colours for suits and blazers, but people have started trying different colours too. Speaking about changing trends, celebrity designer Neeta Lulla says, a�?Indian men are experimenting with colours these days.a�? Justifying the change of mentality among Indian men in terms of colours for their suitings, Ganesh Nallari, Director and Designer Consultant at Chic Pea Studio said, a�?Indian men to an extent are open for new colours, especially for weddings. People are opting for traditional motifs in wovens and prints in brighter colors which can give it an Indian feel.a�? Suits and blazers always helps a person to man up and gives him the elegant look. Little did we know that our body type decides the perfect suiting for us. Pointing out the basic facts before selecting a suit or a blazer, Nallari, the designer says, a�?For bulky or heavier body types it is suggested to use light weight fabrics in darker colors, solid are best or you could try vertical stripes. A two button jacket with a single vent on the back ideal. Thinner lapels are better to give a leaner look. On the other hand, for leaner body types, heavy weight fabrics can help getting better structure and lighter colors to add volume, a high button stance works well too. Vents are optional preferably not required. For tall people, wearing a regular rise pants will look good and low rise pants for shorter men.a�? Apart from just the classic suits, the trend has also incorporated few new accessories that can be donned to add to your charm. a�?Bow ties, pocket squares, scarves, braces, cufflinks, tie pins and hats are few of the additions that can be made to brighten up the classic suits,a�? says suit expert Nallari. Now-a-days printed suits or jackets have also become a sensation. Thanks to Bollywood actot Ranveer Singh who keeps setting the trend in the fashion world. 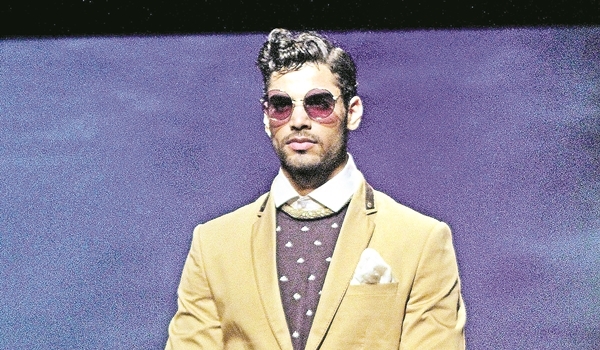 Besides this, Neeta Lulla feels that a suit can be worn in a quirky way too. She added, a�?I think a quirky way of wearing it is without a shirt or even wearing a suit on a shiort kurta. Classic suits can be worn with trousers and long kurtas too.a�? Selecting a good suit for your skin shade is also important. If opting for different colours apart from the black and grey, Nallari believes in choosing colours depending on the shades of onea��s skin tone. a�?People with lighter skin tone should avoid light pastel colors, should try browns, burgundy, bottle green, navy. Medium skin tone people have a wider color choice, try shades that are either little brighter or darker than the medium tone. Beige, coral and Purple are good options if you prefer a light or dark color must try avoiding yellows and greens. Dark skin toned people also have a wider option like the medium skin tones but should avoid dark colours.